The V30S is a good smartphone. It compares well to other flagship Android devices in pretty much all respects. Its only real downsides is that it's a flagship which is not using the latest chipset and the fact that the selfie camera image quality is nowhere near flagship territory. Last year’s LG V30 was a surprisingly strong device from a company that has trouble selling smartphones. Rather than just wait to launch a new G-series flagship, though, LG decided to build this — the V30S ThinQ. Here’s the rub: the hardware differences are nearly negligible, and the AI image recognition features that define the V30S ThinQ are being made available to the original V30 as well. Ultimately, there’s nothing outright wrong with the V30S ThinQ; it’s just wholly unnecessary. The V30S ThinQ is a step too small above last year’s V30 in terms of spec improvements. As such, the value put forward seems poor compared to recent smartphone stunners. The V30S ThinQ is basically the V30 save for bumps in RAM and storage and a tiny software change to the camera. Unless you must have 256GB storage, there’s actually no reason to buy it over the original V30. The LG V30 ThinQ takes what we loved about the original V30 phone six months ago and adds RAM, new internal storage configurations, and a blue color. It's the sequel to an underrated Android phone, but the specs are behind the competition now, so it's value will depend on how LG plans to price it. The LG V30S is an LG V30 with more RAM and some snazzy new hues – that’s it. All the AI camera tweaks will come to the older model, so that’s not a reason to plump for the S.
The V30S does gain a few more software additions, like improved integration with Google Assistant and LG SmartThinQ connected devices - but what you won't find is Qualcomm's latest Snapdragon 845 SoC. Positive: Premium design; impressive display; solid workmanship; excellent cameras. Positive: Premium design; solid workmanship; nice display. Positive: Great built quality; premium design; powerful hardware; high performance; good price. Negative: Poor selfie camera. Positive: Decent hardware; excellent cameras; nice design. Positive: Excellent cameras; nice display; beautiful design. Positive: Good cameras; powerful hardware; solid workmanship; smart AI. Positive: Excellent dual cameras; nice display; premium design. The Android Oreo-powered LG V30S retains the exact same design as the V30, the same dual-camera system, the same 18:9 display, same 3,300mAh battery, and same Snapdragon 835 processor. The only upgrades are to memory, with the V30S stepping up from 4 GB of RAM to 6 GB, and from a choice between 64 GB or 128 GB of storage to a 128 GB or 256 GB selection. The AI Cam facility is licensed by LG from EyeEm, which is a tool called EyeEm Vision, which other phone makers are free to license too, and its machine-learning system has been trained on 100 million images. It surfaces keywords related to things it recognizes as user point the camera at various objects or scenes, which is a really nice and immediate way to tell that the camera’s judging the scenes correctly. The AI Cam will produce better, more accurate color than the unassisted LG camera. Another tweak LG’s made with the V30S camera is a new Bright Mode, which combines four pixels into one to produce brighter pictures in extremely low light. The trade-off there is the loose of resolution for improved exposure. Finally, LG’s added a QLens image detection tool to the camera. QLens plugs into Amazon’s online store and is supposed to let user shop just by taking a photo of a thing user want. Piece for piece, the LG V30S ThinQ’s design is just like that of the V30. Good news, the almost all-glass look with the glossy steel frame still looks incredible in 2018. Thanks to its 18:9 aspect ratio, the V30S ThinQ feels smaller in the hand, packing in a surprisingly roomy six-inch P-OLED display that powers a 2,880 x 1,440 resolution that’s HDR-ready, suitable for watching movies or playing virtual reality games in Google Daydream. The rear-facing fingerprint sensor on the back also acts as the power button. Presses in to toggle the screen on and off. Other features include the USB-C charging port and speaker, both of which are on the bottom of the phone. A bottom-firing speaker means that the LG V30S ThinQ is one of the few flagship phones without stereo speakers. On the music side of things, users get unparalleled support with both a 3.5 mm headphone jack backed by a Quad DAC and Bluetooth for wireless headphones and speakers. Touching more on the Quad DAC, LG’s phone has an audiophile hardware implant that boosts the sound quality of content, even if it’s lossy music files from Spotify or YouTube. The battery is another area where things haven’t changed for the V30S. It features the same non-removable 3,300 mAh capacity, only enhanced this time around by the added efficiency brought along in Android Oreo. Google claimed to enhance its Doze mode to be better at optimizing battery life for the times when the phone is with the user, not just when it’s set on the night table while the user sleep. 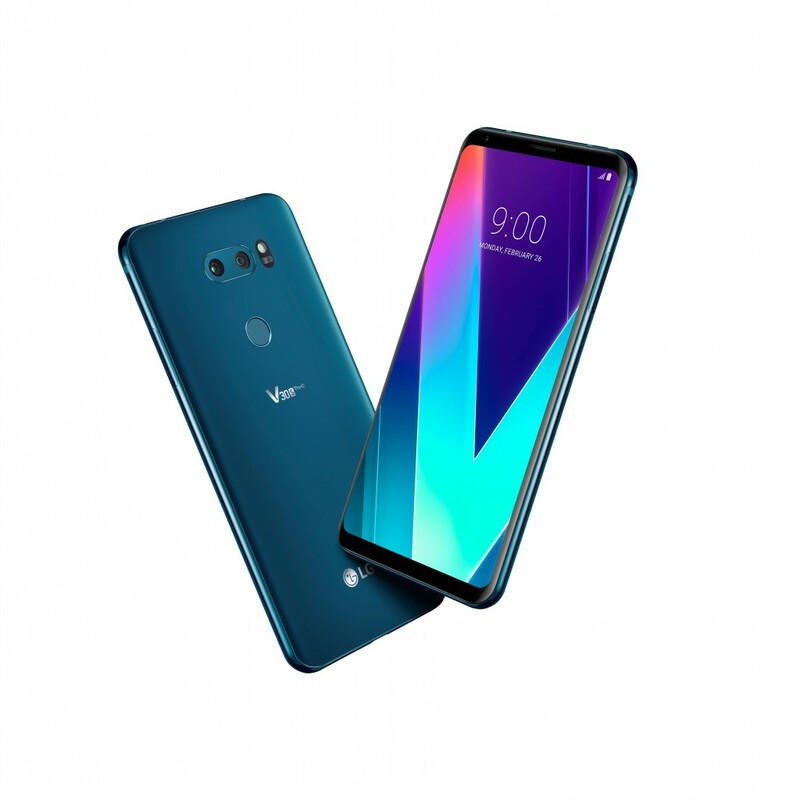 The LG V30S ThinQ is the successor of the LG V30 released in 2017. It has been announced at the MWC in February 2018 and is expected to release in the first quarter of 2018. The phone is already available in Korea at the time of writing. The camera app features AI Cam and QLens, now. However, not much has changed compared to the predecessor beyond that. www.techradar.com summarizes that the V30S ThinQ looks exactly like its V30 predecessor. They call it a functional design, but would have liked to see some change. The phone has a front/back glass (Gorilla Glass 5) and an aluminum frame. Color variants are Maroccan Blue and Platinum Gray. It measures at 151.7 x 75.4 x 7.3 mm, weighs at 158 g and uses the modern 18:9 format. Thanks to being far taller than wide, you can easily wrap your hand around the 6-inch phone. The volume buttons are located on the left side, while SIM and microSD slot sit on the right side. USB-C charging port and speaker occupy the bottom side. A 3.5 mm headphone jack, a feature often omitted recently, is present. The fingerprint reader on the rear side also servers as power button. There are two models, single SIM (Nano-SIM) or hybrid dual SIM (Nano-SIM, dual stand-by). The phone is IP68 certified for dust and water resistance (up to 1.5 m for 30 minutes) and MIL-STD-810G compliant. The phone features Wi-Fi 802.11 a/b/g/n/ac, dual-band, Wi-Fi Direct, DLNA, hotspot, and Stereo FM radio with RDS. It supports GPS with A-GPS, GLONASS, GALILEO. The phone features a dual camera on the rear side consisting of a 16 MP (f/1.6, 1 µm, 3-axis OIS, PDAF) sensor and a 13 MP (f/1.9, no AF) sensor – the same camera hardware as in the V30. It features phase detection & laser autofocus, a LED flash, geo-tagging, touch focus, face detection, HDR, and panorama. Videos can be recorded at [email protected], [email protected]/60fps, [email protected] with 24-bit/192kHz stereo sound recording. HDR is supported. The secondary camera is a 5 MP (f/2.2, 1/5", 1.12 µm) shooter. AI Cam and QLens sit near the shutter button in the camera app. www.techradar describes that upon tapping QLens, the software will look for an item to scan and tries to find a match for it on Amazon or Pinterest. Moreover, you can scan QR codes with it. AI Cam guesses what you are looking at and tries to finds the right color balance and exposure levels. www.techradar.com evaluates, “It’s the ultimate auto mode, though it sometimes take a few guesses to get the scene just right. And sometimes it just gets things horribly wrong.” www.scmp.com writes that the scene-recognition feature was first found in Huawei’s Mate 10 Pro and the V30S’s is noticeably slower. It takes two to three seconds (vs. instantly on the Huwaei), because it uses a standard GPU instead of the more AI-ready NPU found in the Chinese handset. www.digitaltrends.com confirms that AI Cam is relatively slow. Another new camera feature is Bright Mode, which combines four pixels into one to produce brighter pictures in extreme low light. You will get brighter images with lower resolution. This change is also coming to the existing V30. www.techradar.com are disappointed by the general camera performance despite the phone comes loaded with camera features – many of them unique. They find that the new AI Cam or QLens features do not really add a whole lot to the experience. In their opinion LG’s camera app is still among the best. www.gsmarena.com compares photos from the V30S ThinQ to the V30’s and finds that the differences are small at best. In one example the new phone's image is even worse. As for the selfie camera they say that they unsurprisingly did not see any notable difference between the two phones. www.trustedreviews.com also finds that the resulting image did not seem any different. In contrast, Vlad Savov from www.theverge.com thinks that the AI Cam produced better, more accurate color than the unassisted LG camera and calls it an encouraging start. www.techradar.com thinks that smartphone photography has really moved leaps and bounds since the V30 released and recommends considering the Google Pixel 2, Samsung Galaxy S9, and iPhone X if you want a better camera. The 6-inch display uses the P-OLED technology, features a resolution of 2,880 x 1,440 pixels, 16M colors, and is HDR-ready. The 18:9 display has a pixel density of about 537 PPI. www.trustedreviews.com writes that it is the same quad-HD+ panel as before – with all the same issues (e. g. whites are constantly washed out). While the LG V30s ThinQ still uses the Qualcomm MSM8998 Snapdragon 835 chipset found in the predecessor, LG has increased the RAM capacity from 4 GB in the predecessor to 6 GB in the V30S ThinQ. The octa-core CPU consists of four 2.45 GHz Kryo and four 1.9 GHz Kryo cores and integrates the Adreno 540 graphics chip. In contrast, many 2018 flagships feature the Snapdragon 845. The internal storage has a capacity of 128 GB by default. In addition, the storage capacity can be expanded by up to 256 GB via its microSD slot. www.techradar.com writes that you will get 60 fps (frames per second) gaming despite last year's hardware, Final Fantasy 15 Pocket Edition runs smoothly even with maximum graphical settings and Android Oreo’s picture-in-picture mode works like a charm with YouTube, even while pushing through intense gaming moments. Android Oreo version 8.0 (not 8.1) is pre-installed, which seems to be running just fine on the V30S ThinQ according to www.techradar.com. Moreover, you get LG’s latest in-house user interface. Just as the predecessor, the LG V30s ThinQ features a non-removable Lithium-Polymer battery with a capacity of 3300 mAh. The battery supports Quick Charge 3.0 fast battery charging (50% in 36 min) and wireless charging. Similar battery life as the predecessor’s is expected due to almost unchanged hardware and same battery capacity. The improved efficiency of Android Oreo 8.0 might slightly improve the battery life. techradar.com writes that the phone had no problem lasting through the day for them and even pushing through to a second day, depending of course on what they got up to. They describe that the battery only dropped to 95 % from a full charge in their 90-minute battery drain test, which improves on the 87 % charge remaining on the V30 they tested in 2017. Headphones can be connected via Bluetooth 5.0 or 3.5 mm headphone jack with Quad DAC. There is a single bottom-firing speaker. Hence, the LG V30S ThinQ is one of the few flagship phones without stereo speakers. The hardware differences compared to the V30 are small. Phones with better specs and better performance in tasks like photography are available – often at a lower cost than LG typically charges. What remains are the new smart AI features. www.techradar.com questions the purpose of the V30S ThinQ’s existence since LG shared at MWC 2018 that the smart camera features will be making their way to the 2017 V30. They write that Google’s Pixel 2 has a far better camera, the Samsung Galaxy S9 features a faster, more efficient chipset and the Essential Phone more or less matches the spec at a far cheaper price. The V30 might also be worth consideration, since it features almost the same hardware and its price might fall with the release of the V30S ThinQ. www.theverge.com shares the opinion that there is no hardware reason for the new hardware.